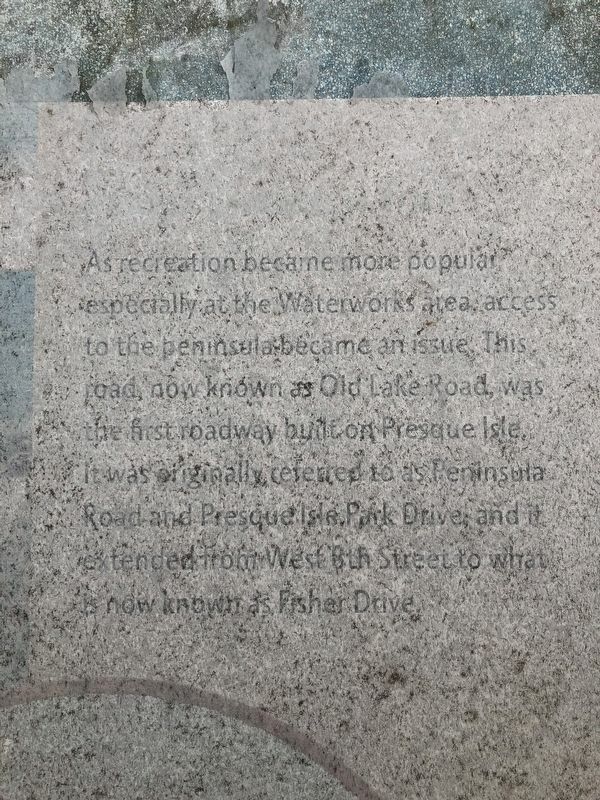 As recreation became more popular especially at the Waterwork area, access to the peninsula became an issue. This road, now known as Old Lake Road, was the first roadway built on Presque Isle. 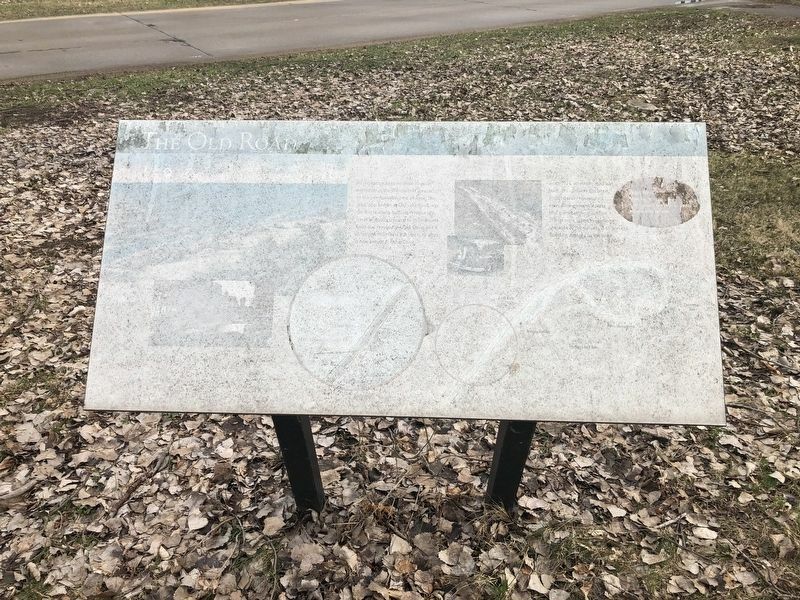 It was originally referred to as Peninsula Road and Presque Isle Park Drive, and it extended from West 8th Street to what is now known as Fisher Drive. 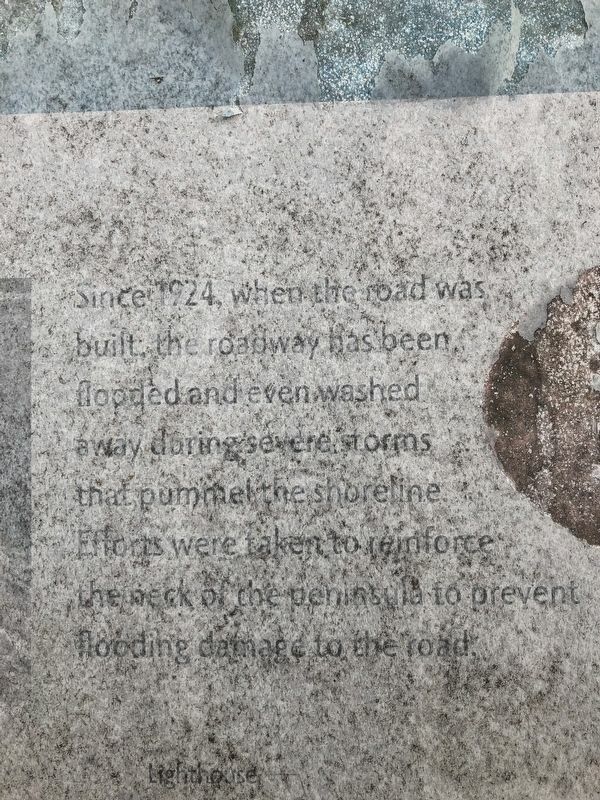 Since 1924, when the road was built, the roadway has been flooded and even washed away during severe storms that pummel the shoreline. Efforts were taken to reinforce the neck of the peninsula to prevent flooding damage to the road. Location. Marker has been damaged. 42° 8.431′ N, 80° 8.369′ W. Marker is in Erie, Pennsylvania, in Erie County. Marker is on Peninsula Drive, on the left when traveling south. Touch for map. Marker is at or near this postal address: 8 Peninsula Drive, Erie PA 16507, United States of America. Touch for directions. miles away); A Century of Recreation (approx. 0.7 miles away); Expanding Erie (approx. 0.7 miles away); Leo's Landing (approx. one mile away); The Barracks (approx. 1.1 miles away); A Walk in the Park (approx. 1.3 miles away); The Lawrence and Niagara (approx. 1.9 miles away). Touch for a list and map of all markers in Erie. More about this marker. Unfortunately, the marker has significant weather damage. More. Search the internet for The Old Road. Credits. This page was last revised on April 16, 2019. This page originally submitted on April 16, 2019, by Devry Becker Jones of Washington, District of Columbia. This page has been viewed 49 times since then. Photos: 1, 2, 3. submitted on April 16, 2019, by Devry Becker Jones of Washington, District of Columbia.